Winter is coming to 4K Blu-ray in June. In an early announcement to retailers, HBO is prepping Game of Thrones: The Complete First Season for 4K Ultra HD Blu-ray on June 5. - Animated Histories: Learn about the mythology of Westeros as told from the varying perspectives of the characters themselves. - Anatomy of an Episode - an in-episode experience that explores the creative minds and colossal efforts behind episode six, "A Golden Crown." - Making Game of Thrones -an exclusive 30-minute feature including never-before-seen footage from the set and interviews from the cast and crew. - Character Profiles - profiles of 15 major characters as described by the actors portraying them. - Creating the Show Open - an inside look at the creation of the Emmy-winning opening title sequence for Game of Thrones. - From the Book to the Screen - executive producers David Benioff and D.B. Weiss along with author George R.R. 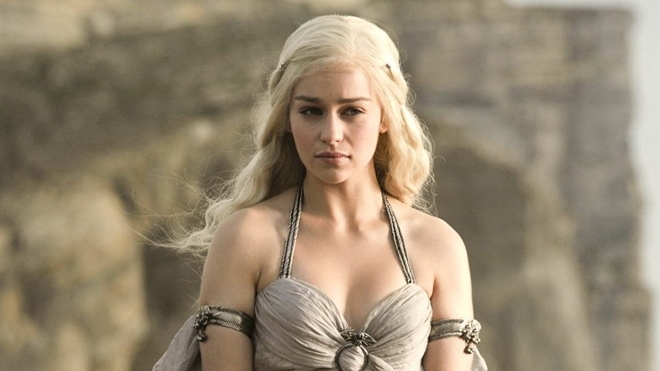 Martin talk about the challenges of bringing Martin's epic fantasy novel to life on HBO. - The Night's Watch - an in-depth look at the unique order of men who patrol and protect the Wall, a 700 foot ice structure that separates the Seven Kingdoms from the darkness beyond. - Creating the Dothraki Language - an insightful glance into the comprehensive language created for the Dothraki people in Game of Thrones. - Audio Commentaries - Seven audio commentaries with cast and crew including David Benioff, D.B. Weiss, George R.R. Martin, Emilia Clarke, Peter Dinklage, Kit Harington, Lena Headey, Mark Addy, Nikolaj Coster-Waldau, Maisie Williams, Sophie Turner, Isaac Hempstead Wright, Bryan Cogman, Harry Lloyd, Daniel Minahan and Alan Taylor. The current list price for the 4K Ultra HD/Digital HD Copy combo pack is $52.99 on Best Buy. 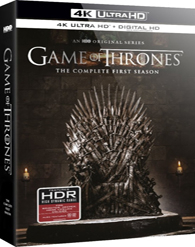 You can find the latest specs for Game of Thrones: The Complete First Season linked from our 4K Release Schedule, where it is indexed under June 5.